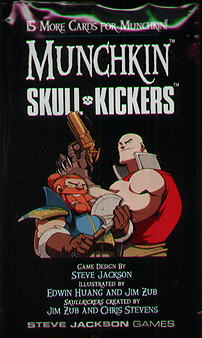 Skullkickers is the hit Image comic of needlessly violent fantasy adventured. In this 15-card booster, Baldy and Shorty tear through the world of Munchkin, destroying everything in their path as they help you fight your way to Level 10. Panic the villagers, kick skulls, and have a fine slice of Justice Pie!